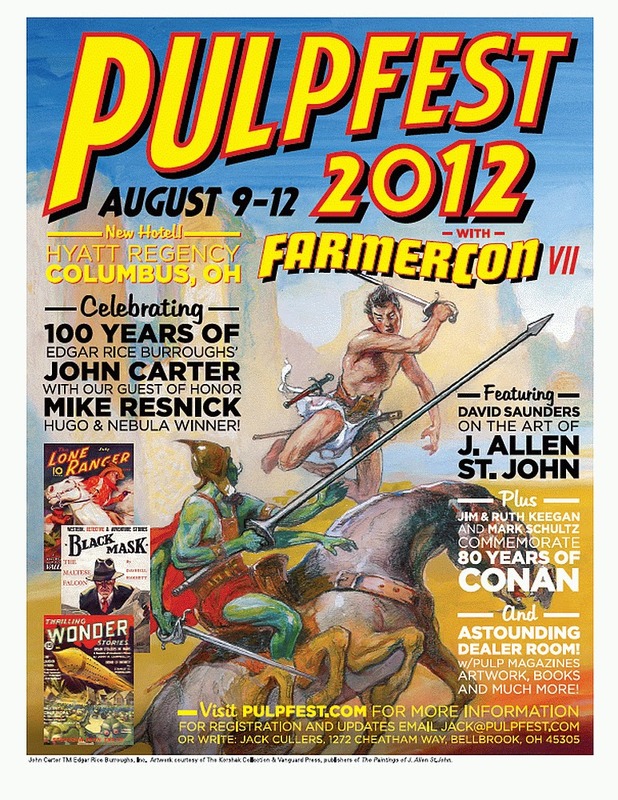 On Saturday, August 11th, PulpFest will celebrate the eightieth birthday of Conan and the sword and sorcery genre with a panel presentation hosted by Rusty Burke, the editor of the highly acclaimed Howard reprint series published by Del Rey Books, the president of the Robert E. Howard Foundation, and a member of REHupa (The Robert E. Howard United Press Association). Joining Rusty for Robert E. Howard’s Conan and the Birth of Sword and Sorcery will be Don Herron, editor of The Dark Barbarian (Greenwood Press, 1984), the first book to treat Howard’s work seriously, and its sequel The Barbaric Triumph (Wildside Press, 2004). For a quarter century, Don has been leading San Francisco’s Dashiell Hammett Tour, the longest-running literary tour in the United States. Also on board will be Brian Leno, an award-winning Howard scholar whose essays have appeared in The Cimmerian, REH: Two-Gun Raconteur, and Up and Down These Mean Streets, and John D. Squires, an Ohio bookseller whose knowledge of fantastic fiction is broad and deep. John is an expert on the work of M. P. Shiel and publisher of JDS Books and The Vainglory Press. Rusty Burke and Don Herron,* of course, need no further introduction. I'd mentioned Brian Leno's "Atali, The Lady of Frozen Death" in 80 Years of Conan, but that's barely scratching the surface of his decades of work. "Lovecraft's Southern Vacation," a look at "Pigeons from Hell" which previously appeared in The Cimmerian v3 n2, can be read online. Most recently he's been doing great work on Howard and his admiration of Arthur "Kid" Dula at the Two-Gun Raconteur blog (parts one, two, three, four, five and six). Were I a rich man, I'd take my private dirigible over to Columbus, Ohio, set anchor above the Hyatte Regency, and parachute down to enjoy what will undoubtedly be a fantastic and informative panel. Then steal all the books, because who's going to tangle with a man who has his own airship? Nobody, that's who. *The site mispelled him as "Heron" in the tags: I can sympathise, having been misidentified at various points as Harrow, Harn, Harren and indeed Herron, but them's the digs. 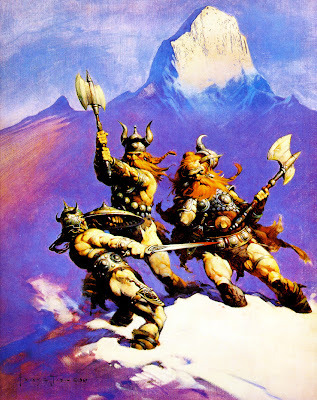 As I've said probably too many times, "The Frost-Giant's Daughter" is a really tough story to do justice, and I was pretty adamant in doing "80 Years of Conan" in the order Howard wrote the stories. That order shows far more "continuity" than any of the fan-made chronologies, and it offers greater insight into the creation of the stories altogether. 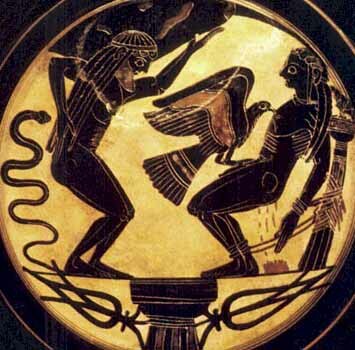 However, it's really tough hewing parts 4 and 5, as they deal with a lot of mythological and literary sources, and it's easy for me to go off on tangents. Therefore, rather than wait until I'm finished the rest of FGD or any one story, I've decided that if I ever get to a point like this, I'll skip ahead to the next one. That isn't to say "The God in the Bowl" isn't as worthy of FGD, far from it: I just believe that it's more straightforward. So if I don't get Part 4 out in the next few days, I'll move on to GitB (though I'm obviously still working on FGD), which will probably just be one or two parts. Then, if I discover there is more to GitB than I anticipated, I already have one post up, so I can go on to the next story, and so forth. Part of this is because I really want to finish this series by the end of the year - 80 Years of Conan, after all - but I also don't want to rush or overlook things either, and feel I was guilty of that in Part 3. Oh, and I have to comment on the wild speculation of a Hobbit Trilogy, which I'm tying in with a few other thoughts on Tolkien merchandising and Christopher Tolkien, but that's another post. That's it, I'm calling a moratorium. Alright folks, I tried. I really tried this time. 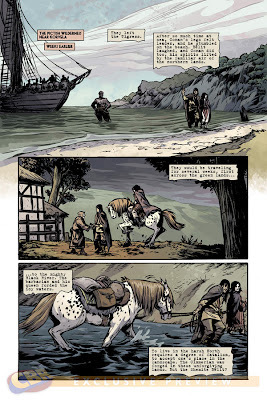 But after reading the preview for #7, I don't think I can talk about Brian Wood's Conan the Barbarian any more. And it's because of this page. Conan and Belit land safely on the Pictish coast, near Korvela Bay. Conan's "spirits are lifted" being in northern lands. Conan and Belit travel through the "green lands" of the Pictish Wilderness for several weeks. Then they hit Black River - which means that cosy little inn there in the centre panel is smack in the middle of Eagle, Toucan or Sea-Falcon tribelands, the most savage of the Pictish tribes. Say, didn't Howard write about Conan travelling through the Pictish Wilderness once, but in the other direction, from Thunder River to the coast? In "The Black Stranger?" What was that like? With a gasping, incoherent imprecation he turned and fled westward. He did not pick his way now, but ran with all the speed of his long legs, calling on the deep and all but inexhaustible reservoirs of endurance which are Nature's compensation for a barbaric existence. Behind him for a space the woods were silent, then a demoniacal howling burst out at the spot he had recently left, and he knew his pursuers had found the bodies of his victims. He had no breath for cursing the blood drops that kept spilling to the ground from his freshly opened wound, leaving a trail a child could follow. He had thought that perhaps these three Picts were all that still pursued him of the war-party which had followed him for over a hundred miles. But he might have known these human wolves never quit a blood-trail. "...You have been living with the Picts?" Valenso asked coldly. A momentary anger flickered bluely in the giant's eyes. "Even a Zingaran ought to know there's never been peace between Picts and Cimmerians, and never will be," he retorted with an oath. "Our feud with them is older than the world. If you'd said that to one of my wilder brothers, you'd have found yourself with a split head. But I've lived among you civilized men long enough to understand your ignorance and lack of common courtesy - the churlishness that demands his business of a man who appears at your door out of a thousand-mile wilderness..."
..."You're lying," said Zarono without conviction. "You've told us one lie already. You said you came from the woods, yet you say you haven't been living with the Picts. All men know this country is a wilderness, inhabited only by savages. The nearest outposts of civilization are the Aquilonian settlements on Thunder River, hundreds of miles to eastward." "That's where I came from," replied Conan imperturbably. "I believe I'm the first white man to cross the Pictish Wilderness. I crossed Thunder River to follow a raiding party that had been harrying the frontier. I followed them deep into the wilderness, and killed their chief, but was knocked senseless by a stone from a sling during the melee, and the dogs captured me alive. They were Wolfmen, but they traded me to the Eagle clan in return for a chief of theirs the Eagles had captured. The Eagles carried me nearly a hundred miles westward to burn me in their chief village, but I killed their war-chief and three or four others one night, and broke away. "I couldn't turn back. They were behind me, and kept herding me westward." This entire story arc is impossible as it is, but the idea that Conan, a Cimmerian, and Belit, a southern woman completely inexperienced in such a climate, could just trek across the Pictish Wilderness with a pack-horse while receiving aid packages from friendly farmers is just... you can't say anything other than it's wrong. Because it is wrong. It's as wrong as Thulsa Doom and Khalar Zym just marching into Cimmeria with little to no resistance for exactly the same reasons. It's as wrong as depicting Cimmeria as a land of cheerful peasants who host pre-Greek Olympic games and battle Dil Pickle dragons. It's as wrong as Conan the Adventurer. There is no way you could spin this as being remotely faithful to the Hyborian Age as Howard wrote it when it directly contradicts practically the entirety of not only "The Black Stranger," but every other story that describes the Pictish Wilderness as a wild savage expanse - like "Beyond the Black River," commonly cited as one of the greatest, if not the greatest, Conan story of them all. This single page invalidates "Beyond the Black River." I'm done, guys. Anything that comes after this page can't possibly top it, and anything I could say would be redundant. Wood, Cloonan. Lolos, Harren, et al, best of luck in your edgy, rebooted, re-imagined Conan, made for a new generation. Call it Ultimates Conan. Call it New 52 Conan. All-Star Conan, Conan Forever, Conan Begins, Brian Wood Presents Conan, Conan: The Quickening, Conan the Barbarian: Friendship is Magic. Call it whatever you like. Just don't call it faithful to the source material. I thought I'd share this interesting little link by author Connor Coyne (what a name!) which discusses Howard in context with Tolkien. I can't seem to log in to comment, so I'm going to take the liberty of doing so here. Of course, Connor is only discussing The Coming of Conan the Cimmerian, and so he still has some great stories to look forward to should he wish to go on to the next stories. 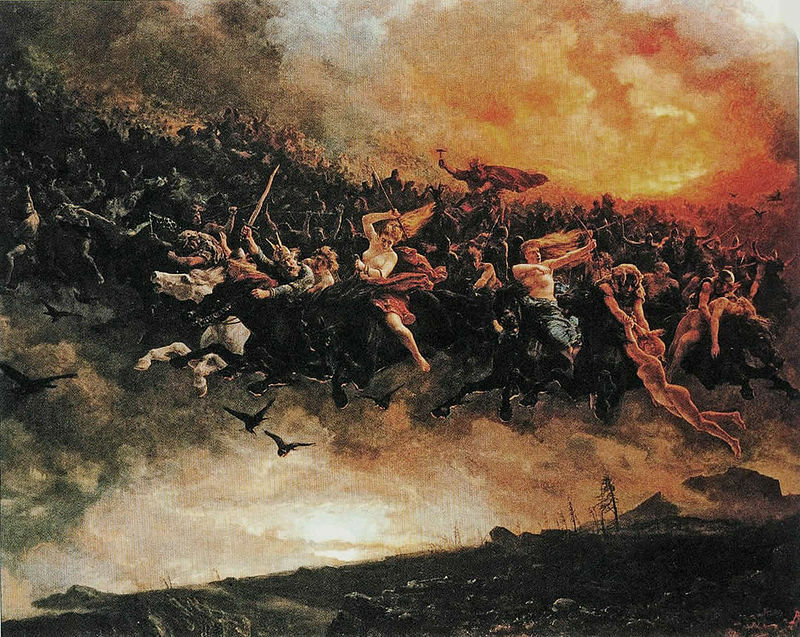 In terms of the writing: Tolkien’s epics took place in “Middle-Earth” which had hints of but little direct connection to the present world, while Howard’s Conan stories took place in the Hyborian Age which was explicitly placed in a period of barbarism and empire-building that occurred between the fall of the continent of Atlantis and the rise of the ancient civilizations we know; these explicit references are most conspicuous in names we recognize from legend and history: Argos, Corinthia, Himaleya, Zimbabwe, and others. Not only did Tolkien write novels, but he envisioned all of these novels being joined by subject matter and common history into an organic whole. Howard works were almost uniformly short stories, and while it is possible to read these as part of an organic whole, he preferred an episodic presentation that emphasized narrative unreliability. Tolkien was quite comfortable deferring to magic as accounting for miraculous events; Howard posits a sort of invisible cosmic ground-state which makes magic-seeming events possible. Tolkien’s gods are unassailable, unreachable, and in fact, only angelic (and demoniac) messengers for a higher power that is only mentioned by name once. Howard’s gods intrude upon the world, and do battle with mortals in a way that is not only corporeal, but which expands the definition of the physical rather than constricting that of the spiritual. And so forth. There are many differences. While it is indeed not as explicit as in the Hyborian Age, Tolkien's Middle-earth is indeed set in the distant past of this world. Also, it's the Himelian mountains, not "Himaleya," and Zimbabwe was later rendered Zembabwei in "The Servants of Bit-Yakin," but I left my pedant-lock key on as I was typing. The most significant difference, however, I thought, is the different take on morality. I recall Carpenter’s biography of Tolkien, at least, saw much significance in his Catholicism, and that the various ranks and orders of beings, good and evil, in Middle Earth, was a validation of the Catholic cosmological order via Tolkien’s own thoroughly British upbringing. Whereas in Conan, while morality is present, it is subjective, in flux, and almost post-modern. The main conflict is not so much good vs. evil as barbarism vs. civilization. The chief difference here between barbarism and civilization isn’t any notion of mercy, or compassion, or empathy, or cooperation; it is a difference of regimentation, and as a result, barbarism doesn’t dissemble. So we are meant to relate to the barbarian, and not the sorcerers, monarchs, pirates, and monsters with whom he contends. In fact, Conan himself is often not sympathetic, although he probably has something closer to what we’d call a “conventional” morality than most of the other characters. But he’s not above, say, genocide (as in “Vale of the Lost Women”). I definitely disagree that Conan was advocating genocide in "Vale." Obviously Conan's at his most dastardly in this story, but the destruction of the Bakalah by the Bamula is really little different from the endemic warfare of countless historical tribes throughout history. Obviously hardly morally defensible, but there's a difference in degree here. 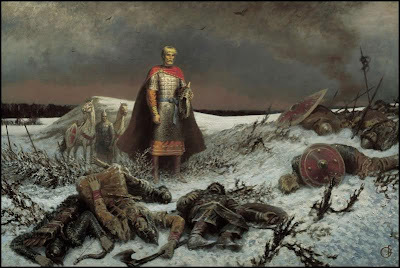 Conan hates the Picts more than any other people, but you never hear him call for their extermination as king despite him being entirely capable of doing so. Curiously, this solved a big problem I have with most high fantasy: How is it that characters meant to embody all that is good and pure — to the extent of making huge personal sacrifices to save the world — are grim killing machines. And I don’t even mean “the good soldier” so much; you don’t see hints of pathos or PTSD after Aragorn, or Drizzt Do’Urden, or Aslan, or whoever kills their 999th orc. This is most often explained away as “all members of X race are evil,” and maybe that passed as acceptable in the decades surrounding the Civil Rights era, but in 2012 it seems deeply troubling on even casual examination. Other high fantasy strategies to reconcile this seem equally wanting. Tolkien wrestled with the matter of the orcs all his life, but the reason you don't see hints of pathos or PTSD after Aragorn because this is a world where evil is practically a quantifiable matter, and an entire race is evil explicitly because they were "created" (or rather, abducted and raised en masse) by a supremely evil being, that perversion of life and robbing of free choice being considered one of Morgoth and Sauron's greatest crimes. Aragorn can sleep at night because he knows that if he doesn't, all he loves will be lost or destroyed. That said, there's definitely an element of regret when it came to the Haradrim and Easterlings, who were either deceived or actively enthralled to Sauron. Conan partially solves this problem by making the protagonist consistently erratic and violent (though surprisingly, never amoral). I never see him as embodying all that is good and pure, but rather all that is barbaric and pure, and this makes his internal logic plausible. It also gives some measure of cover to Howard writing as a product of his time and place, which is to say, often much more explicitly racist than Tolkien ever was (we’re talking about a man who grew up in rural Texas boom-towns, and witnessed lynchings). There is no evidence Howard ever personally witnessed a lynching, but the sheer pervasiveness and virulence of racism in the world during that time period and environment means that Howard's views must be properly contextualised. ...this being “low fantasy” did not prevent it from engaging in poetic, powerful language and grand philosophical themes. Although action-oriented in the manner of (though with much better craft than) TSR-fare, there is a tightly controlled correspondence between the words and actions of the characters. Conan typically prevails because he is typically direct and straightforward; his battle prowess is as much a symptom of this transparency of character as it is his upbringing. Other characters weave byzantine plots only to dramatically fail when they learn that the realities the universe has created for the villains are no more stable than the “realities” they use to trap their victims. A sort of cosmic version of “getting caught in a lie.” There’s a lot of lush, powerful, rich, almost pungent imagery here, but beneath the beautiful writing is an ongoing discussion of Things That Matter. And also interestingly (I’m using that word a lot) this comes forth all the clearer in the “weaker” Conan stories — those featuring little plot except an extra-dimensional monster and a naked damsel — because the Big Questions continue to get play even when the pulp clichès ride heavy. 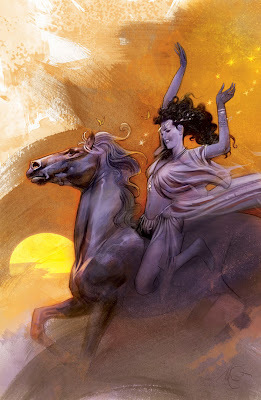 So the lesson there, I suppose, is that I can depart from a “high fantasy” writing style without abandoning, or even mitigating, thematic depth. Couldn't agree more, Mr Coyne. Sometimes you just have to go with the classics. “What manner of men are these northern folk?” asked Prospero. - "The Phoenix on the Sword"
Howard didn't have to look far for inspiration for the second tale of Conan the Cimmerian, and actively drew from the previous story to write it: "The Frost-Giant's Daughter" could almost be considered a direct prequel to "The Phoenix on the Sword," so obvious is the link between the two stories in the form of the above quotations. The shortest of Howard's completed Conan stories is also, in my opinion, the most steeped in myth and symbolism. It may only be 9 pages long, but all nine of those pages are filled with all manner of subtext, some beautiful prose, unforgettable characters and imagery, and an economy which only Howard could provide. "The Frost-Giant's Daughter" may be only 9 pages long, but it's one of Howard's biggest stories, tying in an awful lot of themes and ideas from across multiple stories and mythic inspirations. It's one of the stories that I feel is really important to do justice to, which is why it's taken such a blasted long time to finish: I could've skipped ahead to "The God in the Bowl," but I really want to do everything in the order Howard wrote the stories, since that in itself takes up a big chunk of proceedings. Probably should've split it into multiple parts a while ago. So, in lieu of the next 80 Years of Conan, here's a round-up of links I found of interest. Yes, this is an actual cover for an actual upcoming monthly for Conan the Barbarian. My thoughts? It's the most amazing troll I've seen since the Darrow cover. Fantastic job, Dark Horse. I've been holding off on "80 Years of Conan: The Frost-Giant's Daughter" because I've been wrestling with one of the key issues with the story. I've been conversing with a number of individuals I believe to be more experienced and authoritative in said issue, because while I really don't want to talk about the deeply unpleasant subject, I also think it's important to acknowledge it. In any case, I'll be providing links to places that do talk about it, even if my take is going to be quite limited. However, there's another reason.